Do Nectarines Raise Blood Sugar? 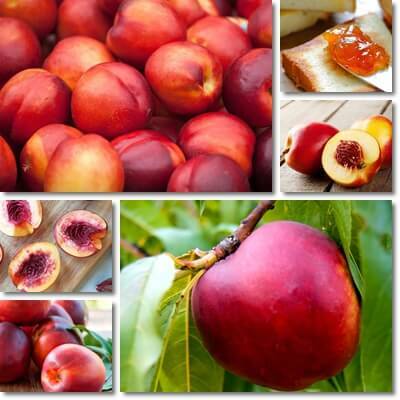 Nectarines will raise blood sugar in diabetics and non-diabetics, irrespective of intake. But the extent to which they raise blood sugar levels is what makes them either good or bad for you. The more you eat at once, the more blood sugar levels will go up. The lower the intake, the less significant the effects. Whether you’re diabetic or not, your goal should be to avoid dietary excesses of any kind, including fruits. It’s natural for all plant foods to raise blood sugar levels. That’s because they contain carbohydrates, a type of essential nutrient that the body processes into sugar which then gets absorbed into the bloodstream, contributing to blood sugar levels (also called blood glucose levels because glucose is the form of sugar that the body uses for energy). Carbohydrates are easier to digest compared to other nutrients (fats and protein) and so they provide quick energy. The simpler the carbohydrates, the faster they’re digested. For example, sugar from nectarines and other fruits is a type of simple carbohydrate. This means it doesn’t require much digesting and will get processed really fast, providing quick energy. If you haven’t eaten in a long time and feel sluggish or feel like you are about to faint, then a sweet nectarine can help restore your energy and good mood because of the sugars in it which get digested almost instantly, reversing your hypoglycemia – low blood sugar. Other more complex carbohydrates in fruits also get broken down into simple sugar forms, but take longer to be digested. And this is good for you because it ensures a steadier rise in blood sugar and more steady energy levels. It’s advisable to eat more complex carbohydrates than simple ones so that you prevent extreme fluctuations in blood sugar and energy highs and lows. Lastly, there is dietary fiber – a very complex form of carbohydrates that doesn’t actually get digested. Instead, fiber merely slows down the digestion process and contributes to a more gradual absorption of sugar into the bloodstream. Nectarines and other fruits are good sources of dietary fiber and sugar, but not very good sources of complex carbohydrates. This is why they tend to raise blood sugar levels fast. 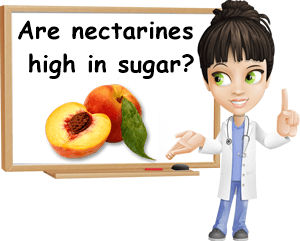 Are nectarines high in sugar? Moderate source, actually. Although some voices may say moderately high. 100 g of the fruit has 7.89 g of simple sugars (in the form of fructose and glucose) of a total of 10.55 g of carbohydrates. One small nectarine estimated at 130 g has 10.18 g of sugar out of a total of 13.61 g of carbohydrates. One medium nectarine estimated at 142 g has 11.2 g of sugar out of a total of 14.98 g of carbohydrates. So it’s not very much, but not a negligible amount either. Yet what makes nectarines good or bad for you depends on how much you eat. The less you eat in one sitting, the lesser the effects on blood sugar. The more you eat, the more pregnant the effects. If you have diabetes, then you are likely experiencing continual high blood sugar (hyperglycemia). It also means that your body is having difficulty in regulating its glucose metabolism due to problems producing or responding to the hormone insulin. In this case, it’s imperative that you limit your intake of carbohydrates from food per day and per meal, nectarines and other fruits included. Don’t get me wrong, it’s good for you and strongly recommended to eat fresh fruit if you have diabetes, but also important to eat them in moderation. For diabetics, a good serving size of nectarines is somewhere along the lines of 100-150 g – less than a small fruit, one small or one medium fruit. It’s preferable to have only one serving a day and separate from other fruits. Ideally, eat the fruit after a meal low in carbohydrates and containing light protein, not on an empty stomach. You can even spread your intake, that one serving, throughout the course of an entire day to further limit effects in blood glucose metabolism. See more useful advice in the article Can Diabetics Eat Nectarines? When eaten in small amounts, nectarines don’t raise blood sugar levels to extreme levels – that’s why they are relatively well tolerated in diabetic diets in limited amounts. The extent to which they affect blood glucose metabolism can be explained by the glycemic index. The glycemic index (GI) measures how fast the carbohydrates in a plant food raise blood sugar levels. Below 55 is a low GI. Between 55-69 is a moderate GI. Between 70-100 is a high GI. Nectarine glycemic index is around 40, which makes it low. In other words, having one small fruit won’t have that big of an impact on your blood glucose metabolism, diabetic or not. It will raise blood sugar levels rather quickly, but not excessively which is a good thing. Only if you eat too much of the fruit at once will you get a sudden and significant rise in blood sugar. Other than this, the fruit is ok to eat.